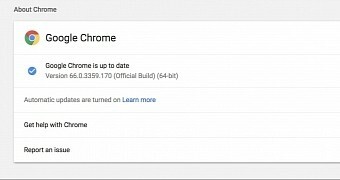 Google released on Thursday a new stable version of its Chrome 66 web browser, version 66.0.3359.170, which is currently rolling out to Linux, Mac, and Windows users, to fix a few important security issues. However, details on how these vulnerabilities could affect users are yet to be revealed with Google saying, "Access to bug details and links may be kept restricted until a majority of users are updated with a fix. We will also retain restrictions if the bug exists in a third party library that other projects similarly depend on, but haven’t yet fixed."